It all happened over lunch one day at the Grand Noble Hotel (they have the best pasta in the town of HuMen; unfortunately, they are the only place with decent pasta; fortunately, their pasta is very good; unfortunately, their service is very bad) where I was having a robust debate on the origins of chocolate or the cacao bean to be specific. I insisted that it originated from Ethiopia while my opponent claimed Mexico. As it turned out, upon whipping out my phone's browser to get onto Wikipedia via GPRS, I realised I confused coffee bean with cacao bean, of which the former was indeed from Ethiopia. When I got home later that evening, I fired up Wikipedia and started reading about cacao beans in greater depth. As anyone who has used Wikipedia would know, it transformed into a "one article after another" type of situation before one realised that it was already dead in the night as the clock above me had turned many rounds. Akk: Do you know my favourite Bombay Sapphire gin and your favourite Grey Goose vodka are both under the house of Bacardi? Next, I ventured into European history as I was currently watching all 9 seasons of 'Allo 'Allo!. I started reading about Adolf Hitler, Hermann Goering, Heinrich Himmler, the Sturmabteilung (SA), the Schutzstaffel (SS), the Gestapo, the Beer Hall Putsch and the Third Reich, just to name a few. Having covered that, I moved onto Ch1nese history, starting from The 3 Sovereigns and 5 Emperors (三皇五帝 2852 to 2205 BC) and currently at Spring and Autumn Period (春秋时代 722 to 481 BC). Anyway, there has been concerns about over-reliance on Wikipedia as a source of facts as many article remained unverified. However, this is not really a concern to me as I find most of them to be fairly accurate. 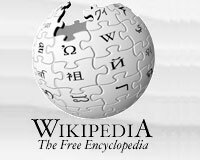 Perhaps the key to the success of Wikipedia is that of its convenient to obtain instant access. Go give it a try if you haven't already done so. Wah... quite dry topics (to me). Unless, of course, you are interested in history. =) It was actually written in the unit outlines that you CANNOT use wiki as a source of reference. Sad sia. But really, I find it quite informative and very useful. Aloe: I have always been interested in history as it will lead to explaining our own exisitence. Anyway, it is getting fairly common for schools to ban Wikipedia as a credible reference. Quite rightly so given that, some of the topics are still ongoing, unverified work-in-progress. Still, it is good enough for a recreational reader like me. Okiedokie: Me reading history is just for leisure only, one of those good-to-know though not need-to-know basis. Besides, it will give me more topics to talk about. Cocoa or cacao? It is very confusing! I think cocoa is the seed in the pod of the cacao tree. Then again, I believe they are synonymous on the basis that perhaps one is the scientific latin name while the other is the common commercial name. can you imagine to my horror when my tutor ask us to check on the Great Depression on wiki.. even economics have to study history also.. pengz!! Gary: The lessons from the past, applies to the present will guarantee a future. The Great Depression was a very important time during our economic history as a civilisation. Definitely worth a read.